The coldest term of the year ‘Daikan’ is at last over, welcoming the arrival of viable season, ‘Risshun’. Risshun literally means spring stands or rises up which practically means that the spring starts. We have been having warm days (17 degrees Centigrade, 63 degrees Fahrenheit) before and on the very day of ‘Setsubun’ this year which made us think that spring is here already as said on the Koyomi but snow and freezing temperature as below 1 degree Centigrade (33 degrees Fahrenheit) on the very day of Risshun started. The best kanjiW idiom we have to express the weather we are facing here in Japan at the moment is ‘San-kan shi-on’. ‘San’ meaning three, ‘kan’ meaning ‘coldness’, ‘shi’ meaning four and ‘on’ meaning ‘warmth’. The idiom is saying that 3 straight cold days are followed by 4 straight warm days, telling us that the warmth of spring will settle down after conflicts of coldness and warmth. There is also a famous proverb of the season as ‘Atsusa samusa mo higan made’ meaning no heat or cold lasts over the equinox. Risshun was resembled as New Year’s season in the past as New Year’s Day was set around this time of the year according to the Lunisolar calendarW. You would know that Chinese New Year is still cerebrated around this time of the year which calendar was also similar to what the Japanese used in the past. You could find that New Year’s Day was celebrated in this time of the year by looking at some of the motifs used in New Year’s Greeting postcards that we still send today. Like plum blossoms and other blooming plants representing New Year usually blooms at this time of the year and not at the time when we celebrate New Year now. When you look at the kanji used to express the word ‘Harukaze’ on this season’s phrase, you would notice that it is written with the kanji meaning ‘east wind’. This season’s phrase expresses the way wind is blowing which is east. We read the kanji for east wind as ‘Harukaze’ to emphasise ‘spring’, ‘haru’ meaning spring and ‘kaze’ meaning the wind because our ancestors have waited and longed so much for its arrival so much. The east wind is also read as ‘kochi’ with same kanji. The seasonal wind blowing from the east at this time of the year for our ancestors were thought to have had special meanings as there are other words expressing the wind as ‘Ume-gochi (plum east wind)’, ‘Sakura-gochi (cherry blossom east wind)’ and ‘Hibari-gochi (lark east wind)’. These expressions were used to distinguish the small changes in spring by temperature changes brought by the seasonal wind blowing from the east which gave people certain feelings of spring’s arrival. Still, the seasonal wind is not practically blowing from east all the time nor ‘warm’ as we feel from the image of the word ‘Harukaze’. It is said that kanji meaning ‘east’ was used to express the wind blowing at this time of the year because east was thought to be the direction which controls spring in ‘Yin and yanW’ and ‘Wu XingW’ philosophy. 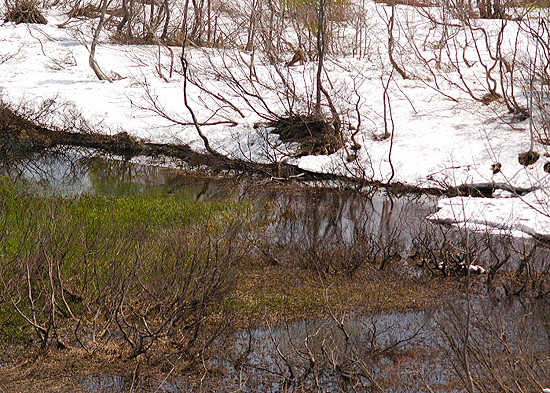 Snow and ice starts to melt…. Photo from ‘Mori-no-tousan Kachofugetsu‘. Going back to the phrase, the phrase follows with ‘kori-wo toku’ meaning melting the ice. The whole phrase expresses the weather changes from winter to spring, reminding us that the snow and ice outside are starting to melt from the temperature rise caused from the seasonal wind change. Before the calendar revision in 1872, Japanese used Lunisolar calendarW as the public calendar. The dates were indicated in Sexagenary cycleW which is in ‘Heavenly Stems’ and ‘Earthly Branches’ instead of numbers. ‘Earthly Branches’ have names of animals as; Rat, Ox, Tiger, Rabbit, Dragon, Snake, Horse, Sheep, Monkey, Rooster, Dog and Wild boar, which may be familiar to those who are interested in Chinese horoscopes. Ouji Inari Shrine on ‘Hatsu-uma’ day, 2014. The shrine famous as a stage of sacred foxes in classical novels and arts. A ‘day of the horse’ points out one of the day in the year when Earthly Branch is at the ‘horse’. The first horse day of the year, ‘Hatsu (First) – Uma (Horse)’ was the day when praying ceremonies for the good harvest of the year by inviting back the god of rice fields from the mountains again to the fields as gods spend their time in the mountains after the last harvest, held every year by farmers, gradually combined to the worship of Inari OkamiW because the very day was the day when UkanomitamaW, the god of food grain in ShintoW landed on the mountain of Inari which is thought to be where Fushimi Inari-taishaW, the head shrine of Inari OkamiW in Kyoto, is placed today. 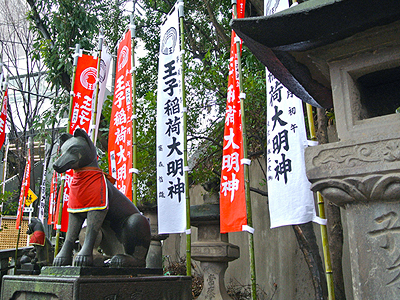 Sacred fox statue and typical flags of Ouji Inari Shrine. The First horse day is celebrated in many shrines and temples all over Japan today which is one of the biggest festival seen at Inari worship. The interesting aspect of the shrines and temples deifying the Inari Okami should be the familiar of the God as they are foxes. There are various views on why foxes became one of the sacred animal. 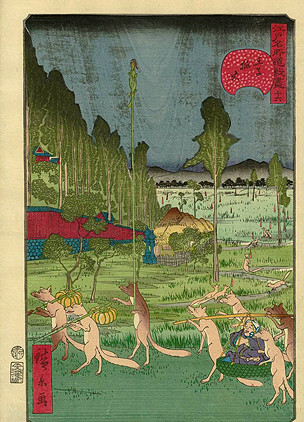 One of the view is that because foxes with their cubs came down from the mountains to the rice fields near harvest. The scene inspired the people as the pioneer of the good harvest because foxes already had their cubs. Foxes were respected and were named as ‘Misaki’ or ‘Osaki’ from the farmers meaning pioneers at some places. It is said that from this respect that foxes gradually became the familiar of the god of rice, Inari Okami. The belief then combined to the Shingon Esoteric BuddhismW and TaoismW magic rituals, gradually making oracles by the sacred foxes popular. The Inari shrines and temples were worshiped and built not only at public places but in the gardens of houses or small compact shrines or alters were placed inside people’s houses as they were believed to be the gods who would grant their wishes in a short period of time. The numbers of Inari shrines and temples increased vastly in Edo periodW when Tanuma OkitsuguW made his career right after enshrining Inari god within his house become the talk of the town. There were over 1,000 shrines and temples in Edo which the state remains in a practical joke of the time as things that overflow in Edo as ‘Ise-ya (one of the common names of a store), Inari and dog poops’! 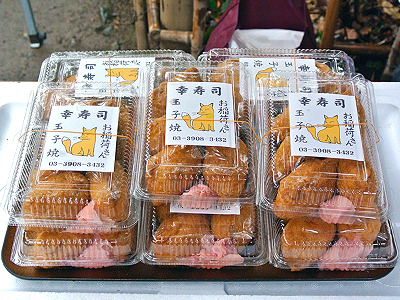 Toyokawa Inari Tokyo Betsuin located by one of the major roads, Aoyma Street, in Tokyo. Various types of sacred fox statues line up in front of one of the shrines in Tokyokawa Inari Tokyo Betsuin. Special offerings containing ‘Aburaage’. 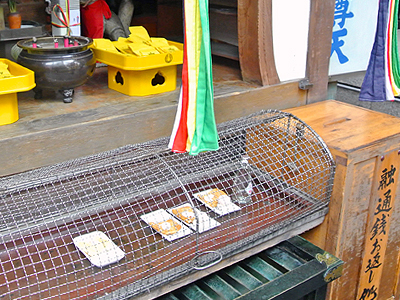 The offerings are covered with steel net to avoid wild birds and animals eating. 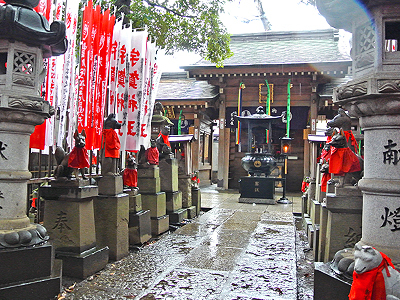 You may have noticed that there are both shrines and temples which deify Inari. This is because Inari god was combined to varuious aspect beliefs with the passage of time and that Shinbutsu-shugoW, mixture on Shinto belief and Buddhism belief, was not perverted but common until Meiji periodW. The Inari shrine enshrines UkanomitamaW, a Shinto god of food grain whereas Inari temple deifies DakiniW. 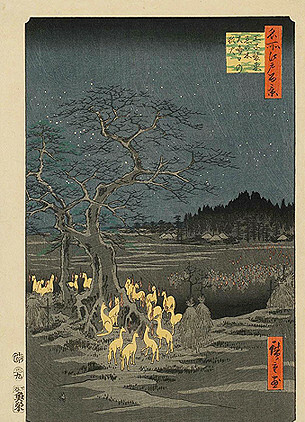 A famous printing by Hiroshige Utagawa of sacred foxes gathering under the huckberry tree near Ouji Inari Shrine to get dressed up on New Year’s Eve. Another piece of sacred foxes in Ouji area bewitching a man, making him think he was the noble on parade. Drawn by Hirokage Utagawa. Inari shrines and temples in Tokyo lessen after Haibutsu kishakuW during the Meiji RestorationW and the Great Kanto earthquakeW of 1923. 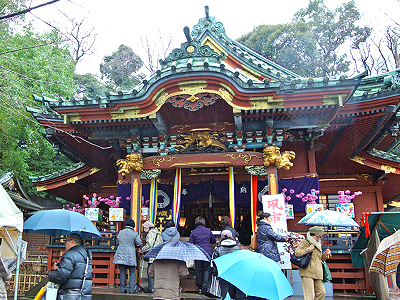 The famous Inari shrines in Tokyo are Ouji Inari Shrine in Kita, TokyoW and Toyokawa Inari Tokyo Betsuin in Moto-AkasakaW. Both shrine and temple have typical stone made statues of sacred fox instead of guardian dogs that you see in other shrines. 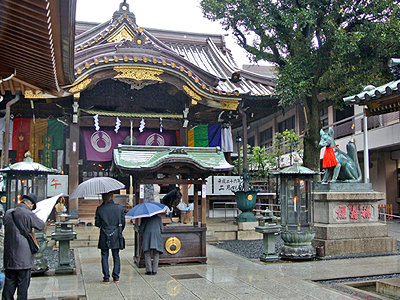 Inari shrines are still popular today as they are shrines where gods who fulfils one’s wish, especially on wealth and public entertainment as well as harvest and success are deified. You can find lanterns offered with names of famous musicians and artist written at Toyokawa Inari Tokyo Betsuin for their entertainments’ success. 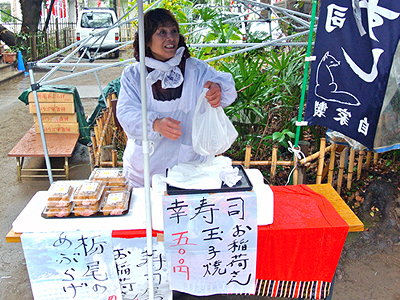 Woman selling ‘Inari-zushi’ at her stool on ‘Hatsu-uma’ in Ouji Inari Shrine. Packages of ‘Inari-zushi’ with label with fox picture! Another interesting things which you don’t find at other shrines and temples are offerings. Apart from bottles of sakeW and rice cakes, which are quite common offerings at sacred places, you will find pieces of deep fried dried tofuW, ‘AburaageW’ offered. This is because sacred foxes are though to like aburaage. Because of such folklore, a sushi which the rice ball is wrapped in aburaage is called ‘Inari-zushi’, one of the popular sushi among the Japanese that can be made or bought easily everywhere in Japan.